I love Spring and its gentle pinks and blues, but, give me this time of year with the intense yellow of goldenrod, the brilliant pinks of ex-asters and the lilac-blues of mistflower against the Autumn blue sky. Spiders are probably laying in wait for unsuspecting visitors. These late summer blooms with their intense, rich colors are a treat for the senses. But, they are so much more than pretty faces. Each one of these darlings provides more pollen and nectar return on investment than many other flowers combined. My rough and tumble native asteraceae are landing pads of deliciousness for butterflies, bees, wasps and moths. They're magnets for all kinds of insects; including some that are themselves food for spiders, birds and other insect eating critters. It's a bug eat bug world in a garden. These beauties are nectar and pollen sources for late visiting bees and butterflies, but also are known host plants for many moths and butterflies. The caterpillars of Pearl Crescent and checkerspot butterflies feed on Symphyotrichum novae-angliae; about ten different moths and butterflies rely on the foliage of Goldenrod; although, Mistflower is primarily a nectar source~it's foliage is eaten by several moth and butterfly cats. Goldenrod even provides shelter for the curious little Goldenrod Gall Fly that makes this gall its home. My love affair with native plants has been going on for so long that they seem more beautiful to me then many classic garden flowers. I love these rough and tumble, take care of themselves wildflowers. Part of their charm is their good wildlife value. But, their larger charm is that they are absolutely perfect for Clay and Limestone! Nothing stops them from blooming and nothing makes me happier then seeing them in my garden each September. Ps I've been away visiting my son who successfully defended his dissertation then I got sick. Never fly with a head cold, it only makes it worse. Rough and tumble, what an excellent description of the fall beauties, dear Gail. and what exquisite captures of the flowers and pollinators. Crab spider, thank you for the ID, I see that one everywhere. 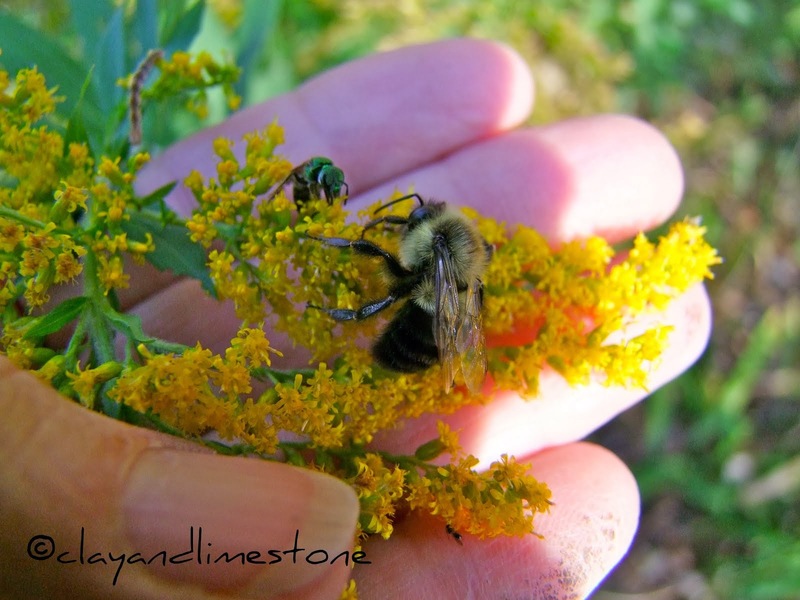 I read that the goldenrod is the number one favorite of a wider variety of pollinators than any other plant. And it is beautiful! The wildflowers of September are beauties. We start the season here in New England with yellow forsythia and yellow daffs and end with goldenrod and those harsh Susan's with their cheery brown eyes. I imagine this is much the same as at C & L with just a few week's difference in bloom time. I must walk in the back field today to check for other possibilities. Oh, white asters are blooming with their yellow eyes...love them. And I have a crab spider photo in waiting, taken up on a hilltop in the middle of the Tankwa Karoo. Lovely photos. Everything here this fall appears to be white. All color was blown away by Hurricane Irene. I will enjoy yours for now though. I love that photo with the bottle tree in the background...just lovely! That Goldenrod Gall Fly is interesting. I've never heard of it over here or seen on on Golden rod. One of my ex-asters just started blooming and I'm positively enchanted by it. The HG is scolding me because I lost the tag and can't remember which one it is! It's pink like yours, tho. I also like the description rough and tumble. The photos make them appear more delicate looking though. I hope you feel better soon. I posted a couple of bee photos in one of my older posts just for you. Did you have a chance to look at the seeds? Darla, I did and once I can garden again will plant them! Ah, the ex-Asters, what a perfect way to refer to them! Much easier to say than that new word. Did you hear that beautiful mistflower is now an ex-Eupatorium? More mischief! Beautiful photos and gorgeous vibrant colors! "Rough and tumble" is a great way to describe all these beauties, Gail. 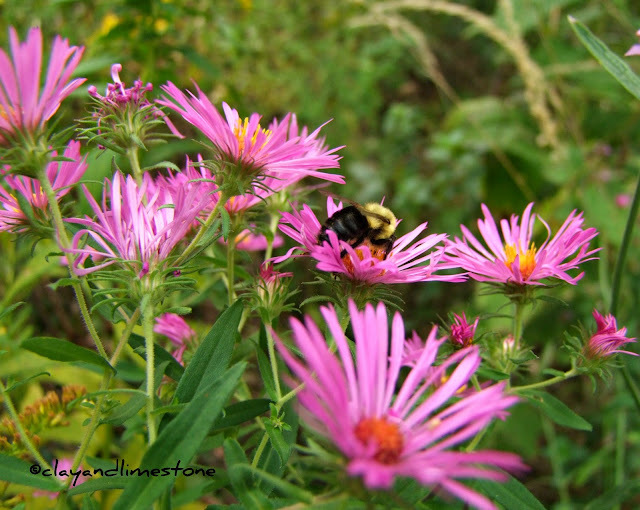 It certainly describes my small butterfly garden this fall where the asters and goldenrod have taken over the show. What's missing from my picture, though, is the blue mist shrub--it looks like the perfect mixer in this group. Certainly hope you're feeling better! Beautiful pictures Gail! I remember when I was a kid running around and playing with the dead goldenrod branches that had formed those galls. Brings back memories of running through the woods and fields as a kid. These are great flowers and photos! We've been getting rain, so I've not taken photos in weeks. Sorry that I've not been around much -- ready for my final draft of my fiction novel. I think I've been writing at least 6 hours a day for the last 30 days. I too am loving the annual display of ex-asters and goldenrods! Cameron, That's so cool~I can't wait to read it. Dave, There's nothing like the smell of fields of wildflowers to take me back in time. Rose, Maybe I can send you seeds? MMD, Isn't it amazing that the European gardeners appreciate our wildflowers more then we do! Cindy, I can't remember their names either! Is that another reason to have a journal! Janet, I was all set to clear some goldenrod out when I saw the galls~Way cool. Leslie, Thank you~The bottle tree is a wonderful pop of color. Robin, White is good! But, I would miss these beauties~So you are welcome to hang around on the porch with me. Diana, Your photos are always top notch~can't wait to see it. Layanee, Can you show me a photo of the white asters with the yellow eyes? I took some photos for Wildflower Wednesday today, then came to check to make sure it wasn't last week. 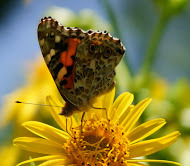 I enjoyed seeing your wildflower beauties and the critters. I always like to include critters in my photos, too. What is the last plant you showed? It reminds me of liatris, but I'm not sure if that's what it is. I am also planting more and more native plants in my front yard. I found a plain phlox pilosa with no other name with it Friday. I put a cage around it right away so the rabbits can't get to it. I'm afraid they are going to have a feast in the spring, because many of my plants are their favorites. I hope your son gets a great job dong what he went to school for, and that you are feeling better. I just remembered the other name with the first phlox pilosas I planted is 'Happy Traveler'. Have you heard of that? Hi Gail, Your photos are outstanding. I love that nature provides all these beauties so late in the season. Great photos. Love your pollinators..full of pollen like saddlebags on their hind legs. Have never seen a gall like that. Maybe I need to keep my eyes open more! Your natives are gorgeous! Especially that last purple beauty. Love it! Lots of beautiful blooms & they have the little wonders on them. Strange time of yr for here but say a June bug yesterday. We called it that when we were kids. I hope you are feeling better, and I am glad you are back on-line, especially since you are showing such nice photos.